One of the more intriguing stories coming out of Capitol Hill recently has been the struggle over whether or not Ben Bernanke will (or perhaps more importantly should) be nominated for a second term as Chairman of the Federal Reserve. To briefly recap events, President Obama announced in late 2009 that he would nominate Bernanke for a second term amid speculation that he was leaning toward replacing the one-term Chairman. Opposition to the confirmation arose last week when two key Democratic senators – Russ Feingold of Wisconsin and Barbara Boxer of California – announced that they would formally oppose a second Bernanke term. The senators’ decision to speak out suggested that there was growing bipartisan discontent for the Chairman and indicated that he might need strong Republican support in order to earn a second term. Both proponents and opponents of Bernanke feel they have a strong case. Supporters will argue that Bernanke and the Federal Reserve guided America through the greatest economic downturn since the Great Depression and his guidance helped stabilize a crumbling financial industry. Adversaries will contend that the housing market collapsed, predatory lending thrived and the government spent billions in bailouts under Bernanke’s watch. Many Americans are currently struggling with unemployment and staying current on their mortgage and want their senators to empathize with their plight. Backing a Fed Chairman who was on watch during a period where banks extended credit to people who had no hope of paying it back while paying out millions of dollars in bonuses to “fat cat bankers” as Obama referred to them could be viewed as political suicide. The election in Massachusetts was a signal that Democratic support among Americans is wavering and elected officials undoubtedly want to stay in the good graces of the voting public. On Monday, it appeared likely that Bernanke will be confirmed for a second term as Chairman but is that what’s best for Americans? What is clear is that if that is indeed the case he’ll be under a much closer watch now than during his first four years. He’ll be under a lot of pressure to make sure that he is providing the resources necessary to create jobs and spur lending to the average consumer yet managing to keep inflationary pressures in check. The notion of “free money” is what caused a lot of the problems of the last few years so Bernanke will need to maintain a careful balancing act of getting money in the hands of consumers while keeping the economy from overheating and torpedoing the value of the dollar. I, for one, would give him another shot. I don’t believe it’s appropriate to place all the blame on him or the Fed for the country’s recent economic shortfalls but it is clear that he needs to maintain tighter controls over what’s going on. I also believe that the Fed’s actions prevented a severe economic recession from turning into what could have been a full blown catastrophe. That having been said it will be imperative for Bernanke to demonstrate that he can maintain stronger oversight over banks and lending institutions and show that he can get ahead of any potential obstacles that could affect this economic recovery. His actions will play a large part in how swiftly and successfully America is able move forward. I’d give him four more years. Of course you would vote for him! You’re the same guy who recently wrote “The Case for Higher Taxes” and then neglected to respond to your reader comments. To start things off, I would like to talk about the comment that the Fed prevented a severe economic recession from turning into a full blown catastrophe. I hear this response all the time but no one ever says what a full blown catastrophe looks like or will look like. Ask yourself, “With an official unemployment rate of 10.1% and an underemployment rate of 17.4%, are things already not in catastrophe mode?” I mean, what does it take to hit that threshold? 20% unemployment? 25%? What? I’d argue that we are already in a crisis and the primary cause of that is the Federal Reserve. They started the fire and were the catalyst that let it get out of control; and now, they are fanning the flames! Some specific examples include: holding interest rates too low for too long; monetizing the debt while explicitly stating that no monetization will occur; and testifying before Congress that the bubble is contained to the subprime market when it fact it has hit subprime, alt-a, prime, and commercial real estate! There is no question that Bernanke should be voted out based on his actions alone. However, even if that were not the case, voting him out is still a good idea because he was unable to see the bubble before it burst last time, so what makes you think he’ll see it the next time? JT: Things are not pretty. We all not that. They have been bad for quite a long time and will probably continue the way they were for a while. I didn’t hear anybody said that we are actually in a good shape because we have Bernanke as the Fed Chairman. Could somebody else do a better in handling the crisis? Maybe. There’s no way to know what would happen if somebody other than Bernanke were in charge. It’s probably true that the Fed should be blamed for not providing enough oversight of the financial system to prevent the crisis from happening in the first place, but I think Bernanke did quite well. Besides, if he’s not confirmed, it will create a lot of uncertainties, which won’t do any good to the market and maybe the economy. I don’t agree that there’s no question he should be voted out. If you remember a few years ago, nobody saw the housing market collapse coming. Everybody was riding the gravy train of low interest rates and double digit annual returns on their property. In hindsight, it’s easy to see how the problems built up. Does that excuse the fact that it happened? No. But let’s be fair. We can’t point all the blame at Bernanke. A lot of people contributed to the problem. I believe that the Fed did an admirable job of preventing things from becoming even worse. I understand there are people on both sides of the argument. That’s why I said a case could be made either way. My feeling is that he deserves a second term but I can understand why some people want him out. “If you remember a few years ago, nobody saw the housing market collapse coming.” Absolutely incorrect. There were plenty of people who saw this coming. To name a few: Ron Paul, Michael Shedlock, and Karl Denninger. It was as easy to see the problems back then as it is now. The fact that a world renowned professor, economic scholar, board member and now chairman of the Federal Reserve could not see this speaks volumes about his talent and foresight. He’s either malicious or incompetent–probably a bit of both. And I’m not saying to point all the blame at him. However, just because it’s not *entirely* his fault, doesn’t mean that we should re-elect him either! And even though I say it’s not entirely his fault, it still is the majority of his and the Fed’s fault. As I pointed out, he was on the board during the Greenspan administration right as Greenspan began blowing the housing bubble. He has no excuse. Finally, I really, really, really want someone to answer my question of what a worse situation would be. Everyone says things could have been much worst but this could be said of absolutely anything. Not to mention, things are still getting worse! They aren’t even getting better yet with respect to unemployment, revolving credit, and wages. So please, what would a worse situation look like? Sure, the world could end at any moment but just because it doesn’t, does not mean that it’s because of Bernanke’s policies. As a matter of fact, if anything is getting better, fundamentally, not technically, then I would say that is IN SPITE OF Bernanke’s policies, not because of them! Bernanke is one of the few in DC I have any faith in. I think people like Bernanke and Greenspan do not belong in those type of jobs where they can cause so much trouble for Americans. I would vote for him as well. It’s unfair to blame him for the financial crisis and bailing out big banks. Some of the problems were created/inherited from the Greenspan era. Of course, with the coming election, Congress wants to find somebody to blame for the mess. I am honestly flabbergasted by the comments here. Sun: It’s absolutely FAIR to blame him for a major part of this crisis! I hate the argument that it’s not fair to blame him for what he inherited; that is complete BS. He signed up for the job! It’s not like we thrust this position upon him. Furthermore, HE WAS ON THE FEDERAL RESERVE BOARD DURING THE GREENSPAN ERA! He was a part of the decisions that helped create the crisis. As a matter of fact, he joined in 2002 just as they really started blowing the bubble. Not to mention he’s was a Professor a Princeton before that, so presumably this guy is the cream of the crop. There’s no excuse for his lack of foresight when it came to this bubble. Thousands of bloggers all around the world saw this coming well before it hit us. He was still saying everything was contained back in 2007 when we already knew housing prices were dropping likes flies! “There’s no way to know what would happen if somebody other than Bernanke were in charge.” This is such a bad argument I almost don’t want to comment on it. So because we can’t know the future we might as well re-elect him? We can’t know the future if we do elect him either! However, we can take a pretty good guess that we’ll just keep doing business as usual. You, sir, are part of the problem why idiot incumbents get re-elected year after year. Who cares what policies they have? Might as well just vote for them anyway. That mentality is what hampers progress and is something every person should strive to overcome. “Besides, if he’s not confirmed, it will create a lot of uncertainties, which won’t do any good to the market and maybe the economy.” Way to spout some Geithner rhetoric. This is a non-sequitur and a logical fallacy. Like you said earlier, we have no way of knowing the future so you can’t possibly know that voting Bernanke out will have a negative effect on the markets. I, on the other hand, this it would have a positive effect, especially if we elected Volcker, who has been the Chairman previously. He has some common sense and dealt with the inflation of the 70′s. 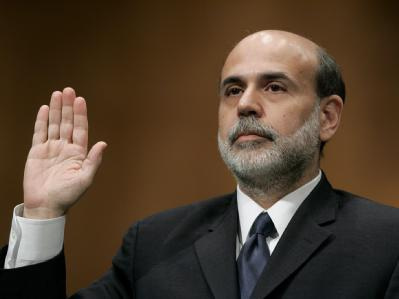 He has experience, intelligence, and best of all, he’s not Bernanke! I welcome a response, hopefully more thought out this time, although I doubt I will get one. Bernanke definitely missed the housing bubble. But to say that a ton of people had it right is also rather false. The vast majority of the people who had it right (like Ron Paul) have predicted a collapse of everything and happened to be right on this one. But still there are a few people who predicted it who are true professional economists and actually predicted it using their knowledge and research instead of throwing out crackpot ideas. While I won’t excuse Bernankes lack of foresight in the housing market, there are some explanations for it. The one I agree with is that he is now part of the system, he hobnobs with bankers and whatnot constantly. Although he is still an academic and has a strong academic background, the noise of Washington and the finance juggernauts could have blinded him to the reality of the situation. A lot of you seem to be placing excessive blame for the operations of the Fed on Bernanke himself, which I find to be flawed. He is the chairman of the Fed, not the whole fed. He speaks for the FOMC and his word is not that of a god. All of his statements in public are as the chairman of a group of people with diverse opinions, not that of an academic who says what he thinks. He no longer has that ability. I still believe he has the same views as his days in Princeton just does not share them publicly. Having said that I think those views make a prominent appearance at the FOMC and without him we would stray much further from good economics than people are willing to admit. If Bernanke is not to have a second term, the replacement will be far more radical and Fed policy would become worse. Senate votes in favor of Bernanke, market sells on the news! So much for Sun’s idea of “if we don’t vote for him the market will tank”. At least Edwin offers a decent response, which I can actually appreciate. However, I disagree with his last statement that the replacement will be far more radical and the Fed policy would become worse. Like I mentioned before, I think Volcker would make a fine substitute as he has already held the position, and it was during of time of high inflation and great turmoil. The 70-30 vote is not a close vote, so Bernanke seems to have the backing of the majority. By confirming Bernanke, at least one possible uncertainty is removed. The market definitely doesn’t want any uncertainty at this moment. Volcker brought the high inflation under control, but right now I don’t think we need an inflation hawk to head the Fed because the current inflation level is still very low. Of course, one can always argue that the benchmark used by the Fed to measure the inflation doesn’t really reflect the inflation we see in our everyday life that the real inflation is much higher than what the Fed sees. However, what the Fed needs to do now is to provide the monetary policy support for the economic recovery. Inflation may not be the biggest concern right now. You should know better. The majority is not always right, and this is certainly one of those cases. The market may not want uncertainty, but it appears that they also don’t want the status quo either! Your argument against Volcker is completely ridiculous. Just because he fought high-inflation during his previous term as chairman, doesn’t meant that’s the only thing he can do! He’s not a one-trick pony, even though you’re trying to paint him that way! But, take heart, this is one thing I will agree with you on (somewhat). The benchmark used to track inflation is in no way close to the real inflation experienced by the average person. You are correct that they understate it; however, they also overstate it too. They understate inflation during growth periods, and overstate inflation during contractions and recessions. Now is a perfect example of how they are overstating inflation–we are clearly in deflation but they will not ever show the real numbers, much less call it deflation. It’s always “low inflation”, “noninflation”, or “uninflation”. However, all you need to do is look around you to see deflation. There are declining asset values in everything from houses to food items and wages. Deflation is here and it is now! JT, what I meant was that anyone who could politically get appointed would be more radical. There are people who could do just as good a job if not better than Bernanke and Volcker is definitely one of those. I’m just doubtful he could get appointed. Right now what our economy needs is the ability to start growing jobs back quickly. Any worry about inflation would be problematic because holding down inflation hurts the economy’s ability to recover quickly. Not to discount inflation as a problem (because it can be a huge problem) but keeping our economy at 10% unemployment is far more dangerous than having a higher inflation target.